As REBIC previously reported, the City of Kannapolis is rewriting its UDO. In November 2018, City Staff along with the consultant team, Clarion, began that process. 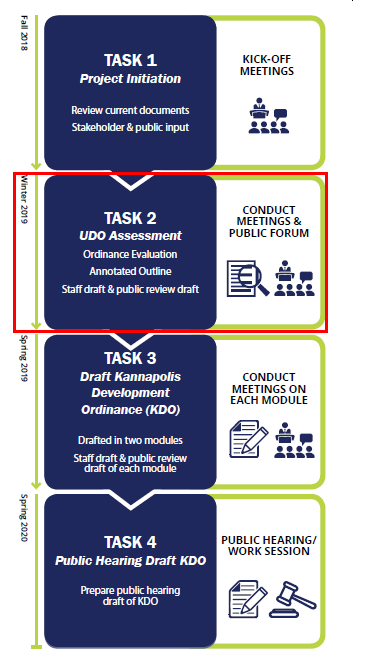 Clarion has prepared a UDO Assessment Report for public review. The report is diagnostic in nature, and serves as an outline of recommended changes that should be considered as the text of the UDO is drafted. REBIC and the City of Kannapolis invite you to review the UDO Assessment Report and provide your feedback. You may do so by email or phone (contact information found below). Clarion will also present the UDO Assessment Report to City Council at its March 25, 2019 meeting. You are invited to attend. The meeting will be held at 401 Laureate Way (City Hall), and begins at 6pm. For your reference, below is a timeline of the UDO re-write process. If you would like to stay informed, please click the link to stay current.